Ah, Fifth Month, you’ve arrived. In addition to providing striking images like this one, the May holiday of Beltane on or around May 1st is one of the four great fire festivals of the Celtic world and of revival Paganism. 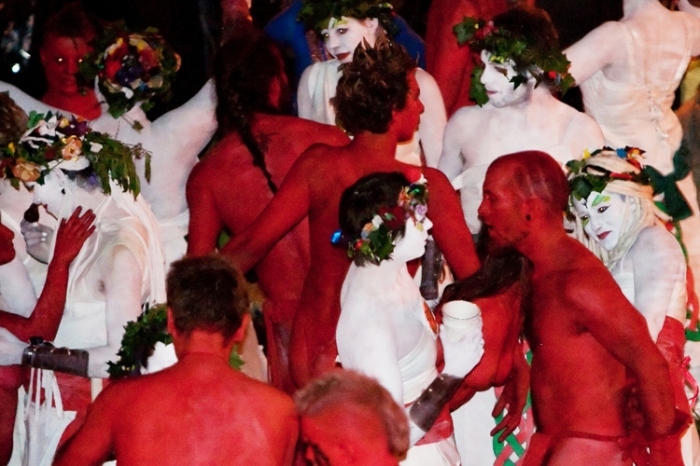 Along with Imbolc, Lunasa and Samhain, Beltane endures in many guises. The Beltane Fire Society of Edinburgh, Scotland has made its annual celebration a significant cultural event, with hundreds of participants and upwards of 10,000 spectators. 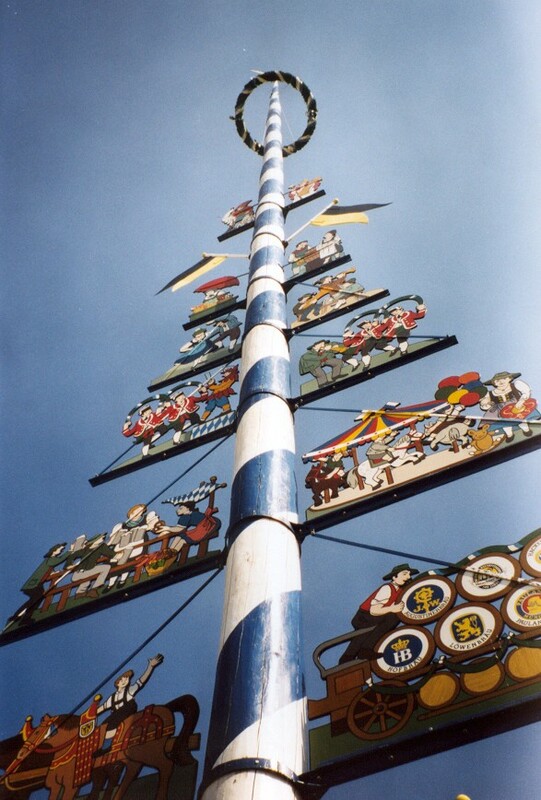 Many communities celebrate May Day and its traditions like the Maypole and dancing (Morris Dancing in the U.K.). More generally, cultures worldwide have put the burgeoning of life in May — November if you live Down Under — into ritual form. I’m partial to the month for several reasons, not least because my mother, brother and I were all born in May. It stands far enough away from other months with major holidays observed in North America to keep its own identity. No Thanksgiving-Christmas slalom to blunt the onset of winter with cheer and feasting and family gatherings. May greens and blossoms and flourishes happily on its own. It embraces college graduations and weddings (though it can’t compete with June for the latter). It’s finally safe here in VT to plant a garden in another week or two, with the last frosts retreating until September. At the school where I teach, students manage to keep Beltaine events alive even if they pass on other Revival or Pagan holidays. Of course, there are other far more subtle and insightful readings of the story, ones which have mythic power in illuminating perennial human challenges of relationship and energy. But what is it about green that runs so deep in European culture as an ambivalent color in its representation of force? 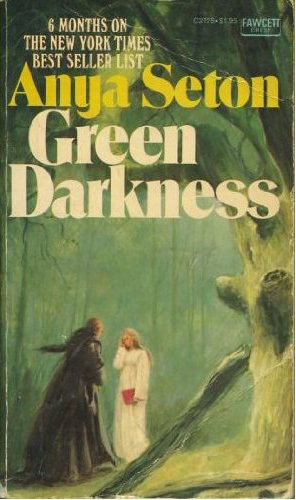 Anya Seton’s novel Green Darkness captures in its blend of Gothic secrecy, sexual obsession, reincarnation and the struggle toward psychic rebalancing the full spectrum of mixed-ness of green in both title and story. 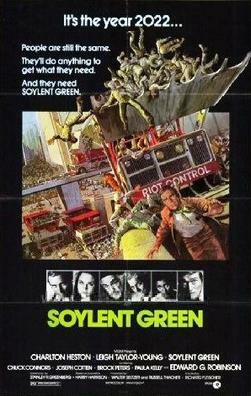 As well as the positive color of growth and life, it shows its alternate face in the greenness of envy, the eco-threat of “greenhouse effect,” the supernatural (and original) “green giant” in the famous medieval tale Sir Gawain and the Green Knight, the novel and subsequent 1973 film Soylent Green, and the ghostly, sometimes greenish, light of decay hovering over swamps and graveyards that has occasioned numerous world-wide ghost stories, legends and folk-explanations. (Wikipedia blandly scientificizes the phenomenon thus: “The oxidation of phosphine and methane, produced by organic decay, can cause photon emissions. 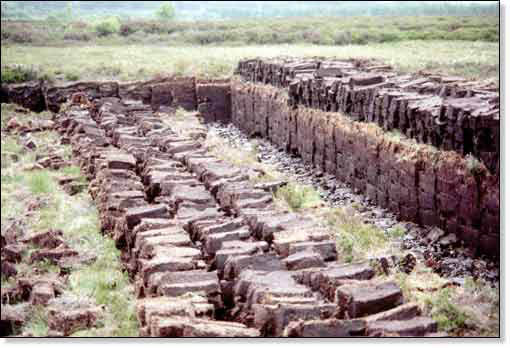 Since phosphine spontaneously ignites on contact with the oxygen in air, only small quantities of it would be needed to ignite the much more abundant methane to create ephemeral fires.”) And most recently, “bad” greenness showed up during this year’s Earth Day last month, which apparently provoked fears in some quarters of the day as evil and Pagan, and a determination to fight the “Green Dragon” of the environmental movement as un-Christian and insidious and horrible and generally wicked. Never mind that stewardship of the earth, the impetus behind Earth Day, is a specifically Biblical imperative (the Sierra Club publishes a good resource illustrating this). Ah, May. Ah, silliness and wisdom and human-ness. Yes, May is death and life both, as all seasons are. But something in the irrepressible-ness of May makes it particularly a “hinge month” in our year. The “green fuse” in us burns because it must in order for us to live at all, but our burning is our dying. OK, Dylan, we get it. Circle of life and all that. What the fearful seem to react to in May and Earth Day and things Pagan-seeming is the recognition that not everything is sweetness and light. The natural world, in spite of efforts of Disney and Company to the contrary, devours as well as births. Nature isn’t so much “red in tooth and claw” as it is green. Yes, things bleed when we feed (or if you’re vegetarian, they’ll spill chlorophyll. Did you know peas apparently talk to each other?). And this lovely, appalling planet we live on is part of the deal. It’s what we do in the interim between the “green fuse” and the “dead end” that makes all the difference, the only difference there is to make. So here’s Seamus Heaney, another Celt and poet, who gives us one thing we can do about it: struggle to make sense, regardless of whether or not any exists to start with. In his poem “Digging,” he talks about writing, but it’s “about” our human striving in general that, for him, takes this particular form. It’s a poem of memory and meaning-making. We’re all digging as we go. 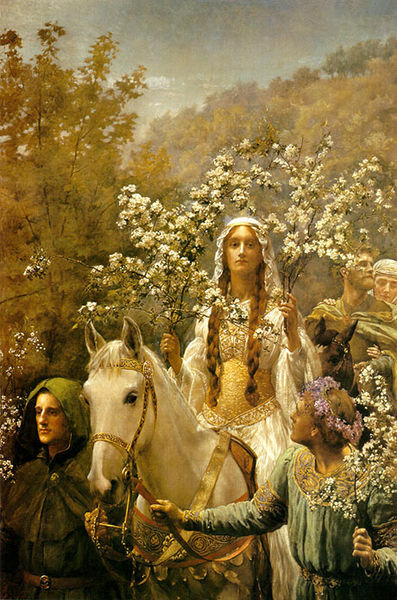 Beltane Fire Society image; Maibaum; John Maler Collier’s Queen Guinevere’s Maying; Soylent Green; Green Darkness; peat. Very well written and researched, and very informative. Oh, and I enjoyed reading it, too! Thanks for sharing. Thanks for reading and commenting, WV.